Monsieur Buat had a workshop on the edge of the town of Senlis, some 35 miles north of Paris. Here, in 1900, he built a voiturette powered by a 3½hp De Dion-Bouton engine that was exhibited at the automobile show held as part of that year's Paris Exposition, but it is doubtful if production followed. 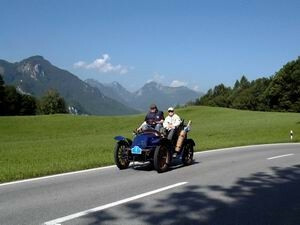 By 1903 the cars sold with the Léon Buat name were actually manufactured by Messrs Lacoste et Battmann, and standard single and twin-cylinder models were available. Additionally, a four-cylinder car was offered the following year, but this was almost certainly also a bought-in product. Both Mors and Panhard-Levassor agencies were held in later years and the firm was still in business in 1913, trading as L Buat et A Rémond.